I have been trying to renovate and make decorating decisions that respect the house without getting all museum-restoration about it or worse, without getting all Miss Havisham, which is to say heavy and dark, cobwebs optional. These tablecloths, I don’t know, too Havisham? They are Turkish, early 20th century. I had thought that they were cotton but now I am leaning towards silk. 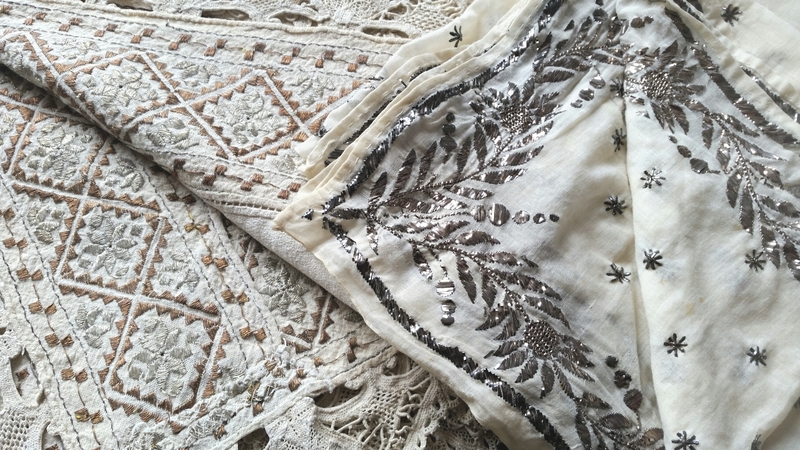 The bottom one is densely woven, heavy fabric with copper and silver threads. the top one is gossamer thin with silver thread. They were pretty dark until a certain blog buddy who knows all about textiles explained how to pull the yellow out and, while I was at it, remove the tarnish from the threads. I had to wash them twice to get them to look like this. The idea is that I have some dark corners in the guest rooms. I like dark but I also like sparkly things glinting in the darkness, reflecting the light. The plan is to get a couple of simple tables and hide them under these cloths. We’ll see. Combined with the kitschy Orientalist lampshades that I have earmarked for the same room, they could be fun. So how did I get the yellow out? Each cloth got its own mesh bag. Into the machine on a low-temperature cycle with mild laundry soap, 2 of those Decolor-Stop stain-absorbing cloths and, because I tend toward the foolhardy, a little Vanish. I ironed them dry. Rumor has it that the windows in the guest room are going in. Soon enough I’ll be able to show you how things are coming together. Could be interesting – is there a good light source so you get the sparkle effect to pop? Well, kinda sorta. That’s the point, really. If the room is already bright, the silver threads will just be one more thing, no match for a battalion of LEDs. In this case the room has a little window on the south and another on the north. The shutters let in a little light, not much. Most of the artificial light comes from the table lamps. The reflected light is most important in daylight when the shutters are closed. Night time is obviously too dark. Shutters open, maybe important, on a cloudy day — lots of those in France. Remember, the threads reflect light, so you’ll get more of a gleam on those days. Table lamps on, less important but they should still be sparkly. Thanks — and thanks for your help. They look great now, can’t wait to see them on display. Don’t know about you, but I could certainly do with a little sparkle in my renovating life right now ……………..! Thanks. Me, too. I wish the lot had been two of those. Funny.Yes, of course, you just light a candle instead of an electric light. That does make them more suitable for dining tables than bedside ones, doesn’t it? Next Post Small miracle: Bob’s Red Mill, in France!